Closing Weekend at Keystone Resort is chock-full of fun parties and events. Don't miss SummitCove Vacation Lodging's end of season lodging specials, 2 for 1 Keystone Lift Tickets, the Keystone Slush Cup, and the Free River Run Rocks. Concert Series featuring Sam Bush. The warm weather and spring skiing conditions have arrived at Keystone Resort! The Keystone Slush Cup is back for the 2nd year in a row to close out the ski season. Contestants arrive in an array of fun costumes and a live DJ spins tunes for the crowd all afternoon. Participants ski or snowboard down the steep 'Go Devil' run in Keystone's Mountain House Base Area while fans cheer them on as they hit a jump that either launches them across or sends them swimming in a pool of water about 25 yards in length. Those who successfully pass will make it to the final round, and then an overall winner will be chosen by the panel of judges. Contestants have a chance to pick up wins in 3 categories: Best Overall, Best Costume, and Best Crash. Prizes include free 2012/2013 Summit Passes and other various prizes for participants. 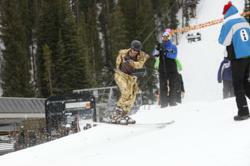 The Overall Winner will move on to the Slush Cup Championships scheduled at Vail Resort on April 15, 2012. Slots for the Keystone event are still available with a $35 registration fee. The ever popular River Run Rocks! Concert Series presented by Bud Light will host it's last event of the ski season on Saturday April 7, with Sam Bush headlining the event. Admission to the concert is free and food and beverages will be available for purchase within the River Run Plaza Area. Keystone Resort is sweetening the deal for spring visitors with Buy One Get One Free lift tickets from now until closing day when purchased at the ticket window. With beautiful spring skiing conditions and an incredible spring events schedule, accommodations in Keystone are quickly filling up. SummitCove Vacation Rentals in Keystone has recently lowered their Spring Season Rates and is offering an extra 30% off stays until the end of April, with visitors coming to ski at the nearby Arapahoe Basin Ski Resort once Keystone closes.